Halloween Lori Mitchell, by ESC and Company. 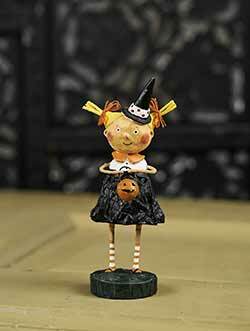 Halloween figurines of darling girls and boys dressed for Halloween - witches, pirate, mummy, alien, jack pumpkins, alice in wonderland, wizard of oz, ghosts, cats, superheros - tons and tons of options! We're absolutely thrilled to announce that not only do we have many new releases for 2018, most of Lori's retired pieces are being reintroduced! This is a wonderful opportunity for new collections to add some of the original and best to their collection. We accept special/preorders for any out of stock or new pieces. We encourage you to pre-order your favorites now, as demand on these is typically high. Once they're sold out for the season, they're gone! In all cases of pre-order, payment is charged immediately and your treasures ships as soon as the items are in our hands. Turnaround time approx 2-3 weeks for current pieces, mid-June for new pieces. After years of bachelorhood, Little Frankie Stein finally has a lovely bride! Captain Kidd, a Lori Mitchell for ESC and Company. This little boy is trick or treating in a fun pirate outfit, complete with hat, eye patch, and parrot! 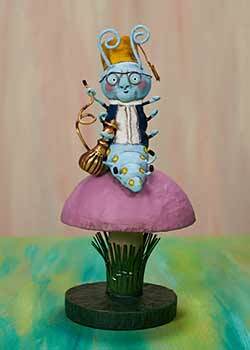 Part of the bestselling Alice in Wonderland Collection, this is for the wise caterpillar, perched smoking on his toadstool! 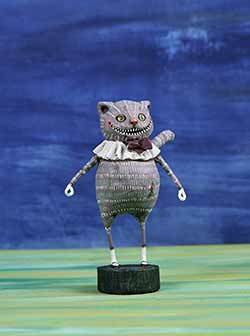 Part of the bestselling Alice in Wonderland Collection, this is for the Cheshire Cat, grinning up a storm! Cool Rider, by Lori Mitchell. 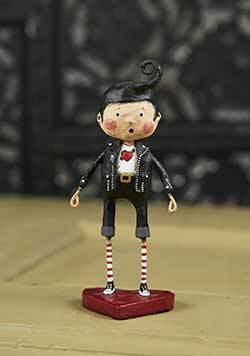 The coolest dude around, Cool Rider is ready for a sock hop, or a malted at the local dinner, in his black leather jacket and heartbreaker T shirt. 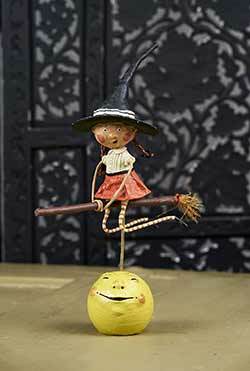 Coraline wears an orange polka dot kerchief over a yellow and black shirt, a star eye patch, and holds a black broom! 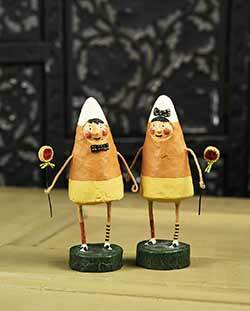 This candy corn couple is ready for some Halloween fun in their candy corn outfits and black and white polka dot bows! Set of TWO. 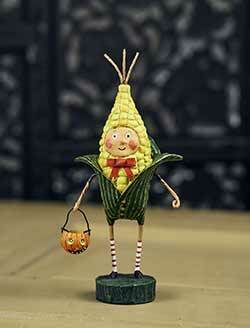 Corny Guy, by Lori Mitchell for ESC and Company. This boy's sweet ear of corn outfit is especially fun, it works for late summer all the way through harvest to Thanksgiving! Dinky Dinosaur, by Lori Mitchell for ESC and Company. This trick or treated is dressed in a sweet dinosaur outfit, complete with tail! He has rosy red cheeks and carries a black and white ghosty treat bag. 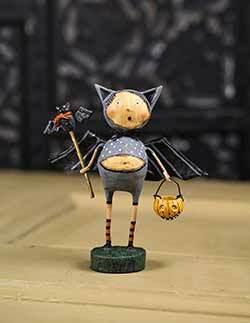 Draco, by Lori Mitchell for ESC and Company. This little boy is dressed like vampire Count Dracula, complete with cape and widow's peak! 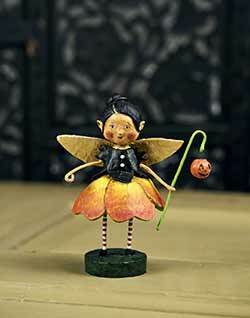 Ember Goblinglow Fairy, by Lori Mitchell. This sweet fairy girl is dressed and ready to go for a magical Halloween night of fun and frolic, in her flower petal dress painted in shades of orange! 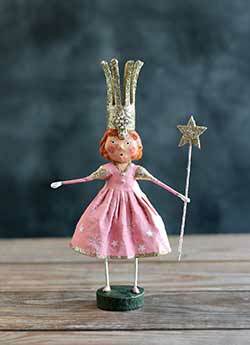 Enchanted Eliza, by Lori Mitchell for ESC and Company. Eliza wears a white dress and orange cape, accented with a black cat. 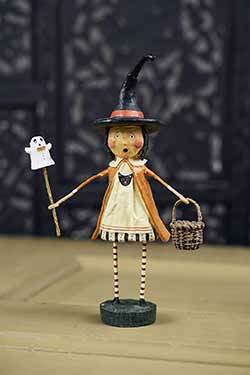 She holds a ghost wand and a tiny basket. 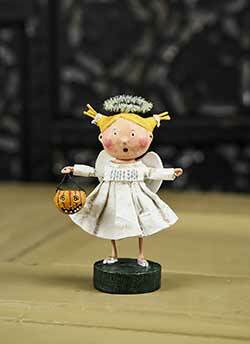 Espirella, by Lori Mitchell for ESC and Company. 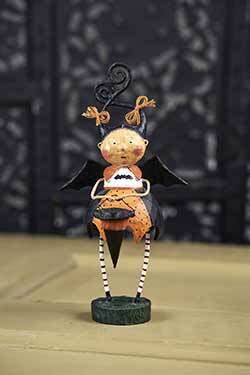 Espirella has festive bat wings and has a simply fabulous hair do! She carries her candy in her witch hat! 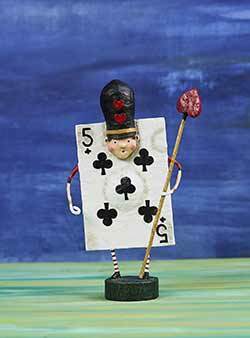 Part of the bestselling Alice in Wonderland Collection, this is for one of the red queens soldiers, the Five of Clubs! 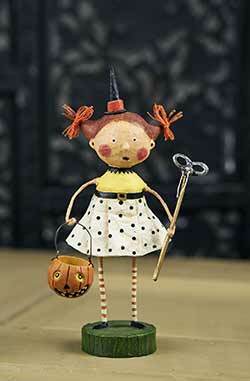 Flirty Gertie, by Lori Mitchell for ESC and Company. 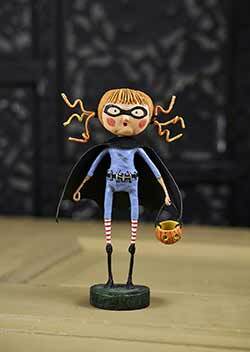 Adorable little girl with red pigtails and polka dotted skirt - she carries a black mask and Jack o Lantern candy bucket. 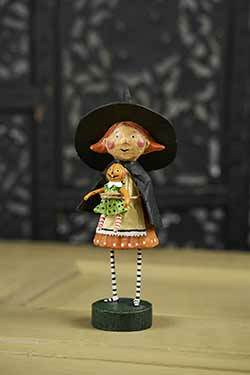 One of our best-selling witch girls! Flitter Flatter, by Lori Mitchell. 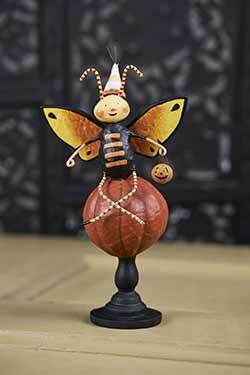 This jolly butterfly is perched on a pumpkin, and colored all in shades of orange, black, and yellow. 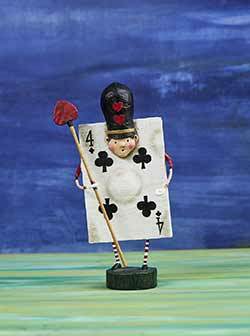 Part of the bestselling Alice in Wonderland Collection, this is for one of the red queens soldiers, the Four of Clubs! 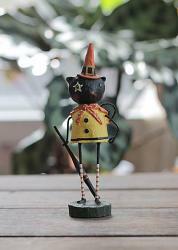 Fraidy Cat, by Lori Mitchell for ESC and Company. This sweet little character is bursting out of a black cat outfit, complete with pink ears, whiskers, and "meow" across her shirt. 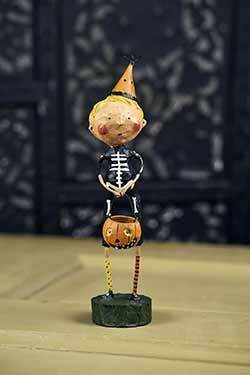 Funny Bones, by Lori Mitchell for ESC and Company. This little boy is dressed in a black suit with a spooky skeleton design! 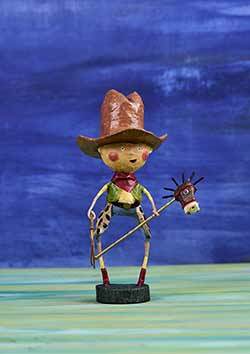 This cute little cowboy is decked out with a cowboy hat, chaps, lasso, and a hobby horse! 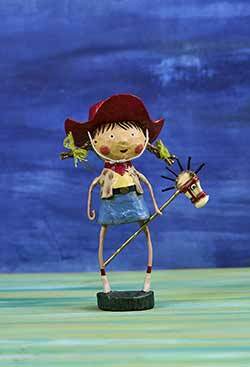 This sweet little cowgirl is decked out with a cowboy hat, pigtails, lasso, and a hobby horse! 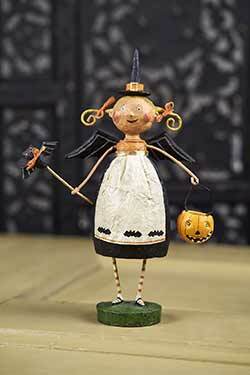 Good Witch Glinda, a Lori Mitchell design for ESC and Company. 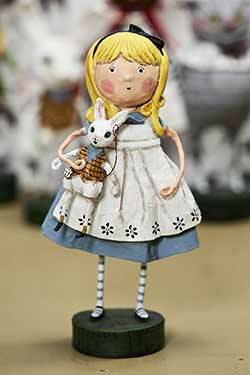 Part of the Wizard of Oz series, we have Glinda, the good witch! Gretta Goodwitch, by Lori Mitchell. 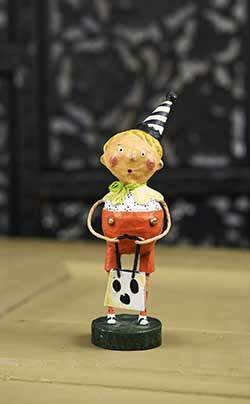 Gretta holds a sweet little dolly, and wears an orange polka dot dress, black cape, striped stockings, and black hat! Grim, a Lori Mitchell design for ESC and Company. 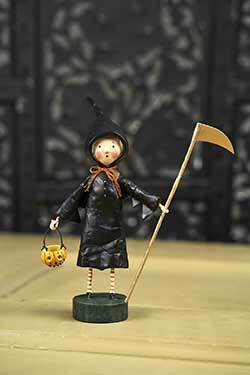 Who knew the grim reaper could be so cute! Here he is, complete with black cloak and scythe! 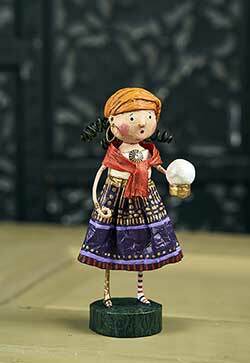 Gypsy Rose, by Lori Mitchell. This bohemian gal is ready to read your fortune! 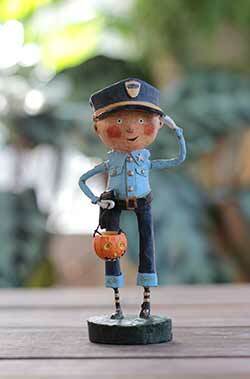 Halloween Heights, by Lori Mitchell. 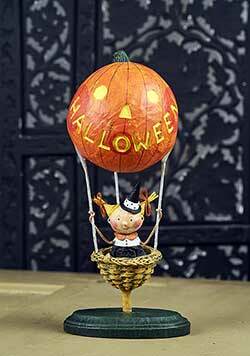 A little girl in pigtails complete with bows rides in the basket of a balloon in the shape of a Jack-o-Lantern grinning the message "Halloween." 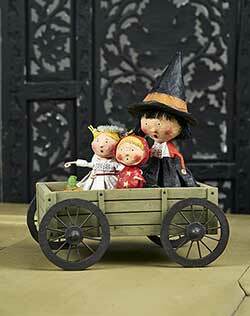 A great way to start a collection, this wagon is filled with three sweet trick or treaters - little devil, angel girl, and Trixie witch! Hoot-N-Hollar, a Lori Mitchell design for ESC and Company. 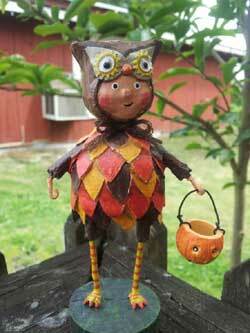 This sweet owl kiddo is ready for fall, with colored feathers, mas, and little bird feet! 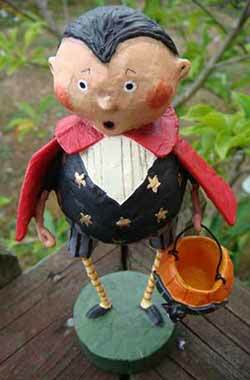 A favorite Lori Mitchell design, Jack Squash barely fits into his oversized pumpkin costume! 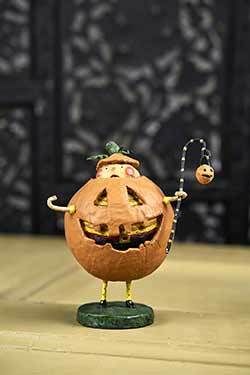 Some of the creative details are his polka dotted stockings, red belt showing inside the pumpkin's mouth, and his squash-top cap. Johnny Law, by Lori Mitchell. For that police worker in your life, this darling trick or treater is dressed in uniform, but ready for candy with a Jack o'Lantern bucket! King of the Jungle, by Lori Mitchell. 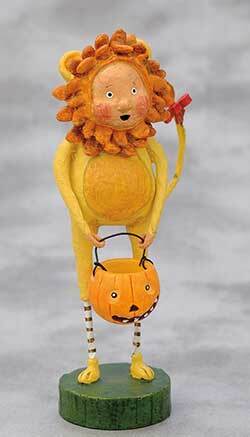 Part of the Wizard of Oz Collection, King of the Jungle is a sweet and mellow lion! 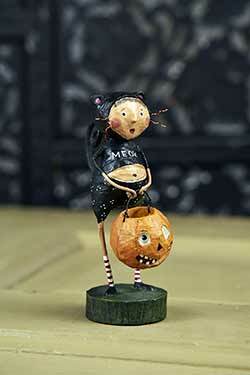 Lil Devil, by Lori Mitchell. This little blonde boy is all dressed up for Halloween fun in his red devil outfit, complete with horns, tail, and fork.